My oldest daughter is a vegetarian, so I try to find vegetarian equivalents of the meals with eat. I’m not eager to make two meals, so the easier the vegetarian version can be, the better. This version for chickpea milanesas qualifies as easy. She likes them well enough that I’ve already made them four times. Using an electric blender, puree chickpeas and water together. Mix in the flour, spices and salt and pepper. Put breadcrumbs in a large plate. Four your hands. Take a large spoonfull of batter and flatten it using your hands. Press onto the breadcrumbs, then turn and repeat. Repeat with the rest of the batter. Heat olive oil over medium-high heat. 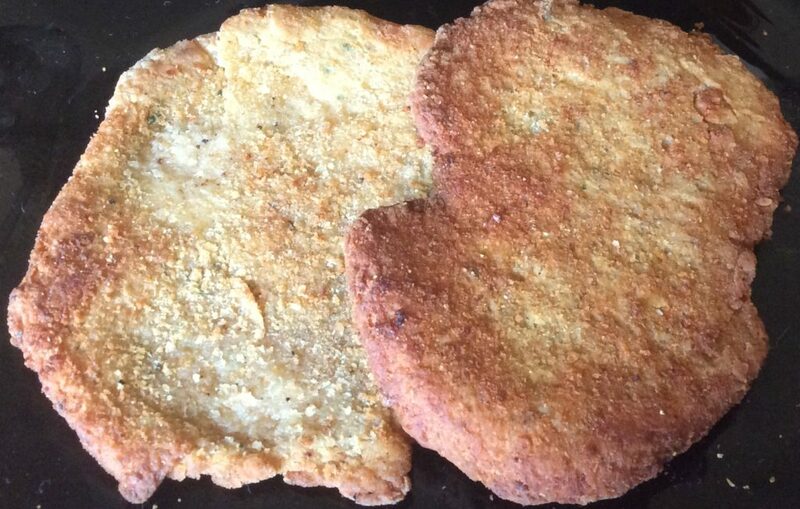 Using a spatula, transfer the milanesas onto the oil and fry for a couple of minutes until golden. Turn and repeat. Remove and drain on paper towels. Sprinkle with lemon juice before serving.